Studies have shown that working out with a partner increases your motivation and improves your training. As a runner it’s much easier to get up and out when you have a partner to run with, regardless if that partner runs on two legs or four legs. Scroll down and see how you can make your dog the best running partner! Do you sometimes feel that running is more like a chore than fun and are you often in desperate need of motivation? Running with your dog might be exactly what you need. Think about it: dogs are always eager to spend more time with you, they have plenty of energy to burn, and the temptation to skip a run melts away when your furry friend stands at the front door, leash in mouth, ready to go for a run with you. Dogs are great running partners, because not only can they help keep you motivated to run, but they can also provide you with security if you choose to run in a remote area. But before you put on your sneakers and reach for the leash, you’ll need to train your pup to run with you. Here are a few things to consider. Is your dog really up for it? Be aware that not all dogs are cut out for long runs. Retrievers, German Shepherds and Dalmatians are all great runners and can be great exercise partners. Other breeds however, like a small Chihuahua, Pugs or a giant breed like a Mastiff, may be more suited to a brisk walk than a run. Accept the fact that your dog may not be a runner and find a speed and a distance that fits both of you. That will make the exercise much more enjoyable for you and your four-legged companion. 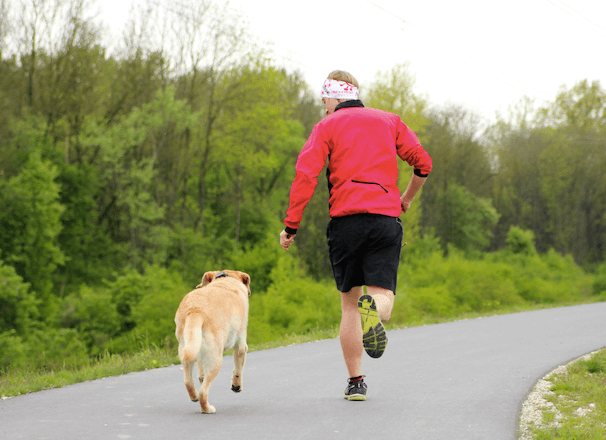 If you’re unsure whether your dog is a runner or not, the vet is the best source of advice. For some breeds running may actually be detrimental to their well-being, so before you hit the road, consider your dog’s health, build, and breed. Pugs and Bulldogs, for example, are likely to suffer from respiratory and overheating issues and older dogs may have joint problems that can make running uncomfortable. So, before you make a running schedule for you and your pup, get a health check with your vet. Just like we need to get medical clearance for exercise, our pets need it too. Just as humans, dogs need practice before they can go for a 5 km run. Too much too soon increases your dog’s risk of injury, just as it would a human’s. Even though it may seem natural for your dog to want to run with you, you must be aware that it takes time to build up the body to run longer distances. Try to start with some walks to allow time for your dog to adapt to the routine of going out with you, and make a plan that will let you and your pup progress at a safe and healthy pace. The great thing about running is that you can do it almost anywhere. But some places are better for your dog to run than others. Streets and sidewalks with hard surface can be tough on your dog’s body. Grass is softer and can be much easier on a dog’s joints than pavement (but beware of uneven surfaces and holes). If you’re running in the heat of summer keep in mind that the pavement gets warm in the sun and can harm your pet’s paws. If the ground is too hot for you to touch comfortably with the palm of your hand, then it’s too hot for your dog to run on. Also, if you are running in winter, through snow and ice, try to avoid streets with too much salt and chemicals as this can be very toxic to dogs. If your dog misbehaves on walks, he probably isn’t ready to run. Teach your dog some basic commands that you can use when you run. “Leave It” is a helpful command, as your dog will learn to ignore or walk away from tempting items on the route (like trash or sticks). Teaching your dog to “Sit” and “Stay” is also very important, especially at traffic crossings. Your pup can’t tell you when he’s thirsty, so make a few water-breaks during the run until you have an idea of how much water your he needs. In hot weather you have to be over cautious with the water because dogs overheat more easily than humans, as they carry a heavy fur coat and don’t sweat. Be nice to your fellow runners and clean up after your dog! There is nothing worse than stepping in a mess that you have to clean off after your run. Poop bags may not fit your running equipment, but bring a bag or two and pick up your pet’s mess – it really is the courteous thing to do! Keeping the environment clean really makes running more enjoyable for everyone. 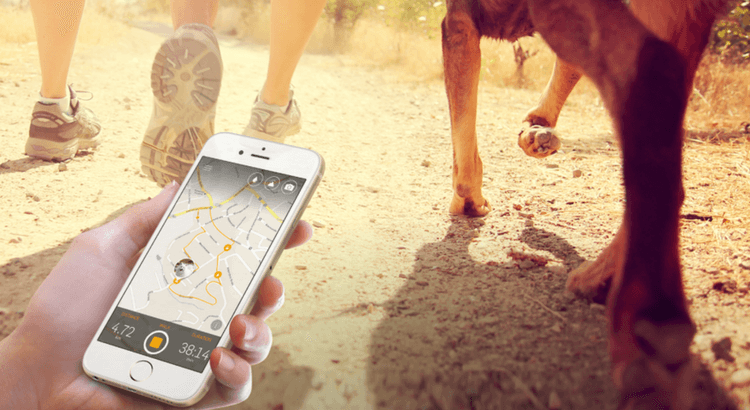 With the Tractive GPS app you can track each run or walk you do with your four-legged friend. The app shows you the exact distance and duration of each run. A great way to keep track of your training. You can even take pictures of you and your running partner and share these great running moments with friends and family. The Dog Walk picture feature definitely makes your run more fun. Do you run or walk with your dog? What have you done to prepare your dog for running?